The spring semester has ended and many faculty are doing summer work, focusing on scholarship, simply enjoying their time away from the classroom, or perhaps a combination of these activities. Here we share answers to our questions about the experiences of Bruce Reichenbach, one of the Augsburg faculty members who retired this year. 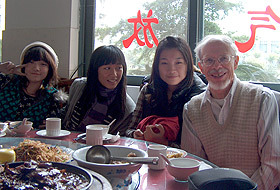 Reichenbach is pictured here with students from United International College in Zhuhai, China, where he taught for a semester in fall 2009. I have enjoyed seeing many students mature in their intellectual and personal lives in their years at Augsburg. One student I fondly remember struggled in my Ancient Philosophy class. She did well on the study questions, but did not see the connections between ideas so that she could perform well on the tests. Logic proved to be almost impossible, but she stuck it out. By Modern History of Philosophy she began to see connections, write good tests, participate in discussions, and ultimately enjoy philosophy. Today she has completed a master's degree, works in a meaningful leadership capacity, and has become a good friend. Her story of challenge with disabilities and persistence to success represents many of my students, all of whom I am very proud for what they have gone on to accomplish. A teacher has to celebrate challenges as well as successes. I taught a medical ethics course at an affiliated school. The students there were prepped to learn to reply and repeat just what they memorized, so that challenging them with questions to think through various sides of an issue was strange to them. About two-thirds through the course they appealed to their Dean to no longer require the course for graduation and to allow them to drop it. I did not know this had happened, and when I held the two classes the next week only a handful of students appeared. When I consulted with the Dean and explained the situation to her, she reversed her ruling and required the students to complete the course. The students again complained, and yet another time she decided that they did not have to complete the course. I finished the term with three brave students in two classes -- not enough to create an atmosphere of discussion and dialogue. It taught me the importance of administrative support for academic engagement and that for some students critically and carefully thinking through issues is challenging and threatening. Perhaps this best explains the reactions I get from people when they ask what I teach and I confess I am a philosopher. I don't teach classes; I teach individual students. Each is unique, with his or her own background, interests, abilities, challenges, and passions. I have come to appreciate those differences and to celebrate the success of each person. I have learned that not all students want to go to graduate school or teach philosophy, or would be able to do so, but to each I can add something to enable them to become more successful at what they love to do and to treasure life-long learning. I have discovered that process is as important as content, so that in teaching often "less is more" in cultivating value-added education. I plan to volunteer teach at universities in other countries, write some books and articles that have been percolating in my head for a while, and travel to visit family and places my wife and I have not been to. I am thankful for the opportunity to teach at Augsburg. It is grace: a gift from God. Colleagues around the college have been sources of new ideas and teaching techniques, inspiration, and encouragement. Most important have been my students, who have shared part of their life with me and allowed me to challenge them with new ideas and to sharpen their critical thinking skills. Their engagement with me in and outside of the classroom always provided the greatest incentive to be available to them, and was the reward for long hours of study and preparation. As one student put it to me: you are fortunate to have the job that you really love to do. Each day I pass through my kitchen door on which I have hung the daily motto for my vocation: Live today with laughter; Learn something new; Love someone by serving; Leave a legacy in another's life.